Let´s start here with the stretching fun. With our 1.2mm and 1.6mm tunnels you can make the first step from classic earrings to flesh tunnels and flesh plugs. Like in all other sizes you can select between various shapes and colours. 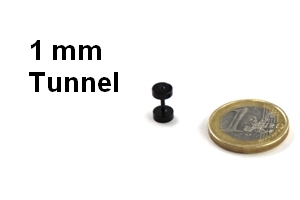 We are sure that you will definitely find your favourite 1mm tunnel here in our flesh tunnel shop. Just browse around in our shop and order what you really like.